Most of the time a “good” product or an “okay” service is enough to satisfy us. We don’t all need to drive a Ferrari or wear an Armani suit to be happy with our lot in life. But sometimes it’s not about what you need, it’s about what you want. And sometimes you want something a bit special. Step forward the TraxNYC diamond watch collection. If you’re buying a diamond watch for yourself or someone close to you, there are hundreds of top class options available to you at Trax. We have watches to suit every budget imaginable. But every now and then a low/mid-range piece just doesn’t cut it. That’s why we house some of the most elegant, intricate and valuable diamond watches in the entire world, and they sit prominently at the pinnacle of our esteemed diamond jewelry collection. 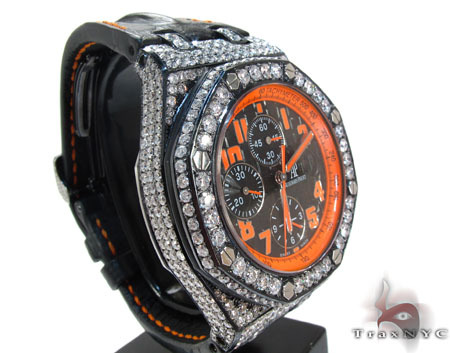 One of the most prestigous diamond watch brands we currently stock is Audemars Piguet. The roots of Audemars Piguet Diamond Watches date back to 1875, when the 23-year-old Jules-Louis Audemars met Edward-Auguste Piguet, then only 21, at Vallée de Joux, which is considered to be the cradle of prestige watch-making. Audemars started producing component parts for movements and Piguet got the job of a repasseur, whose job it was to make the final regulation of the timepiece. At TraxNYC we respect the tradition of great brands like Audemars Piguet – that’s why we are happy to be able to stock three AP Diamond Watches with a combined value far in excess of $100,000. Recently we received a new AP piece into our luxury collection – the Royal Oak Offshore Volcano Diamond Watch. As you can see from the picture, this watch is just about as unique as it gets. It’s clear to see where it gets the “volcano” part of its name from, with the bright orange color emblazoned on the dial, literally making this watch look like one of the hottest pieces ever created. And that before we’ve even mentioned diamonds, and this watch has plenty. The Offshore Volcano will sparkle in the faintest light with 13.75 ct of the finest round cut rocks. This watch is in limited supply, and would cost you close to $70,000 at any other retailer – we’re offering it for less than half of that here at TraxNYC. We are number one for diamond watches, custom work and hip hop jewelry, so there really is no reason to look anywhere else! TraxNYC – the home of diamond jewelry online.